Comments Off on You’ve been Fleeced! 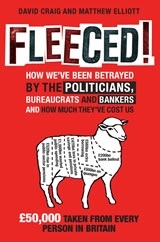 On Monday, Matthew Elliott and David Craig released their new book Fleeced! How we’ve been betrayed by the politicians, bureaucrats and bankers… and how much they’ve cost us, published by Constable. Fleeced! is the very first book to analyse the financial, fiscal and political crisis resulting from a decade spent under the stewardship of Gordon Brown and is a devastating indictment of Brown’s time as Chancellor and Prime Minister. The authors, who were the first to reveal the shocking truth about Brown’s overspending since 1997 in their previous books, show that in 12 years of New Labour around £1.5 trillion of taxpayers’ money has been squandered on an acceleration in profligate government spending fuelled by the economic boom; and around another £1.5 trillion has evaporated in the bust. Matthew Elliott was interviewed on Sky Sunrise on Monday morning and on John Gaunt’s Suntalk radio show on Tuesday.